This lemon blueberry smoothie tastes a bit like blueberry pie but you know it’s loaded up with all kinds of nutrition. 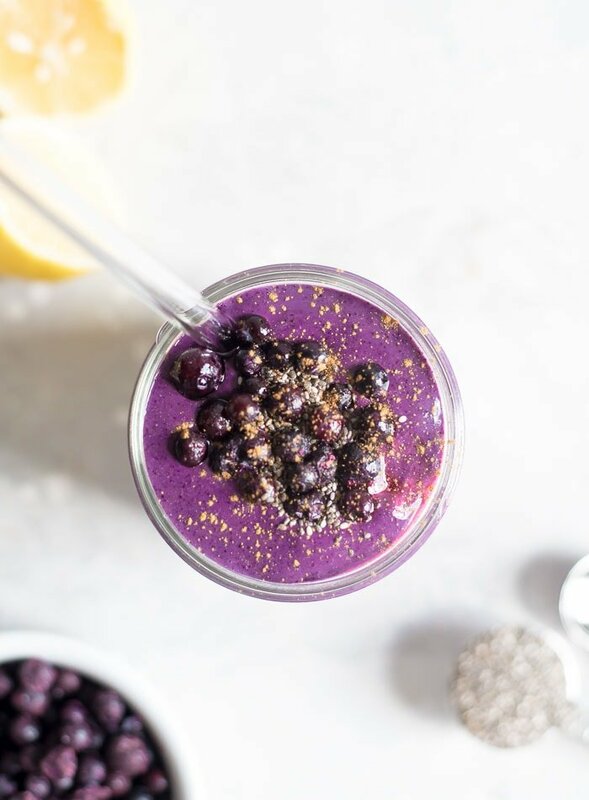 The recipe features antioxidant-rich berries, frozen banana, plant-based protein powder, chia seeds and cinnamon but it’s the pop of fresh lemon juice that really takes this smoothie up a notch. Frozen blueberries. Blueberries are one of the most antioxidant rich, disease-fighting foods you can eat. It’s recommended that you eat at least one serving of berries a day for your health and what better way to do it than a delicious berry smoothie. Plant-based Protein Powder. To boost the flavour, sweetness and protein content, I used 1 serving of vegan vanilla protein powder. Chia seeds. Chia seeds are such nutrient-rich little powerhouses I decided to give hemp seeds and break and go with chia for this smoothie. I used 1 tbsp and I wouldn’t recommend adding more or the texture gets kinda weird as the blended chia absorbs the liquid. Chia seeds contain omega-3 fatty acids, calcium, magnesium, iron, zinc and niacin. Cinnamon. Cinnamon adds a blueberry pie-ish flavour and who doesn’t love cinnamon, am I right? Plus, ceylon cinnamon has anti-inflammatory and blood sugar-stabilizing properties. Lemon. I used 3 tbsp of fresh lemon juice and a bit of lemon zest to add the beautiful pop of flavour to this smoothie. I don’t know what it is about blueberries and lemon but it just works! I’ve also used lime in this recipe and it’s really good too. Frozen banana. I added half a frozen banana for that creaminess you can’t beat as well as extra sweetness, potassium, folate, fibre, B6 and manganese. I used unsweetened almond milk but you can use any plant milk you like, coconut water or just plain, old water. I’d recommend sticking to a plant-based milk for this one though. Cashew milk, carton coconut milk, oat milk, hemp milk or almond milk are all good choices. 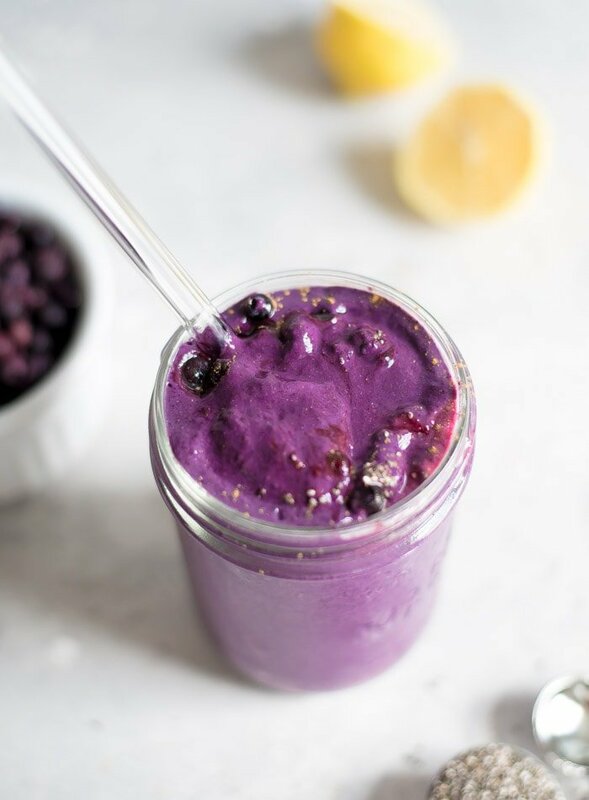 Try this creamy chia seed blueberry smoothie for breakfast or a snack anytime you need a natural boost in energy. It’s perfectly sweet, thick and creamy and the pop of fresh lemon flavour is perfect for Spring and Summer. This healthy smoothie boasts 16 grams of dietary fibre with 24 grams of plant-based protein! You’ll also be getting 52 grams of energizing carbohydrates and 8 grams of essential fatty acids. In addition, it contains 80% of your daily calcium intake, 36% of your daily iron* intake and a good amount of vitamin C, vitamin A and a range of essentials vitamins and minerals such as zinc, magnesium, vitamin K and manganese (iron and calcium content are based on store-bought fortified almond milk). If you like this smoothie, try my Blueberry Banana Smoothie Bowl, Mango Strawberry Smoothie, Mixed Berry Smoothie, Kale Spinach Smoothie or Mango Pineapple Smoothie. This healthy smoothie is loaded with nutrients but tastes a bit like blueberry pie! 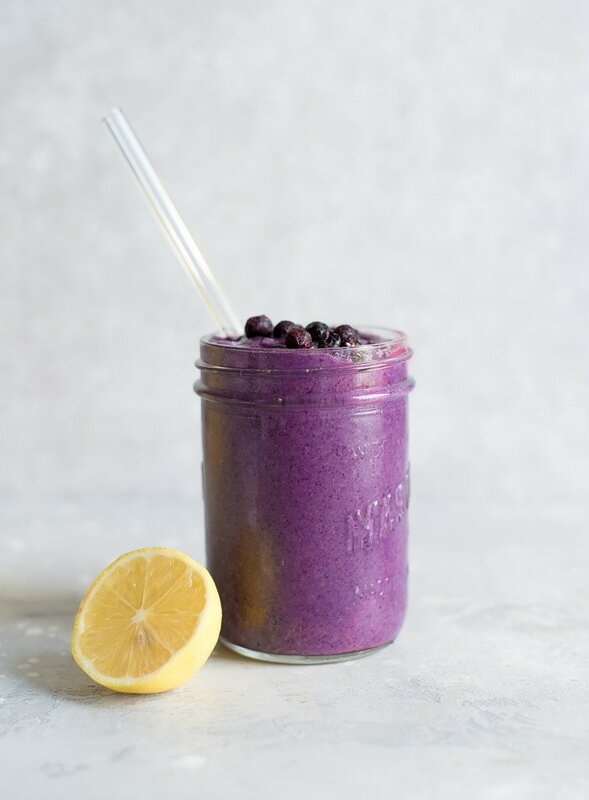 That fresh pop of lemon is to-die-for blended up with frozen blueberries, frozen banana and cinnamon. Add all ingredients to a high-speed blender and blend on high for 30-60 seconds until smoothie and creamy. Pour into a glass and enjoy with a glass straw. I tried this recipe this morning and it was delicious! yay! So glad you liked it. I love this one too! Tastes like PIE!